Earthquakes are some of the most dynamic features of the Earth. 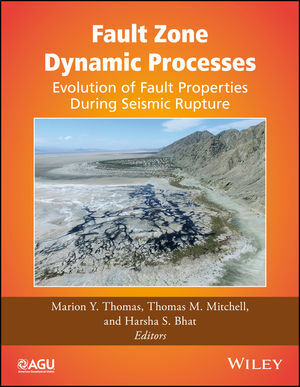 This multidisciplinary volume presents an overview of earthquake processes and properties including the physics of dynamic faulting, fault fabric and mechanics, physical and chemical properties of fault zones, dynamic rupture processes, and numerical modeling of fault zones during seismic rupture. • What are the dynamic processes recorded in fault gouge? • What can we learn about rupture dynamics from laboratory experiments? • How do on-fault and off-fault properties affect seismic ruptures? • How do fault zones evolve over time? Fault Zone Dynamic Processes: Evolution of Fault Properties During Seismic Rupture is a valuable resource for scientists, researchers and students from across the geosciences interested in the earthquakes processes.